More than 20 years of prevailing career readiness skills research consistently identifies mastery of core communication, reasoning, and problem-solving skills as required or highly recommended for most jobs across occupations and industries. The research further defines the standards for those core skills as applied workplace math, workplace reading, and use of charts, graphs, and similar workplace information. These are the standards that are the basis for the proctored assessments and earning the Ready to Work Credential. In study after study, employers identified a lack of skilled workers as their biggest challenge. 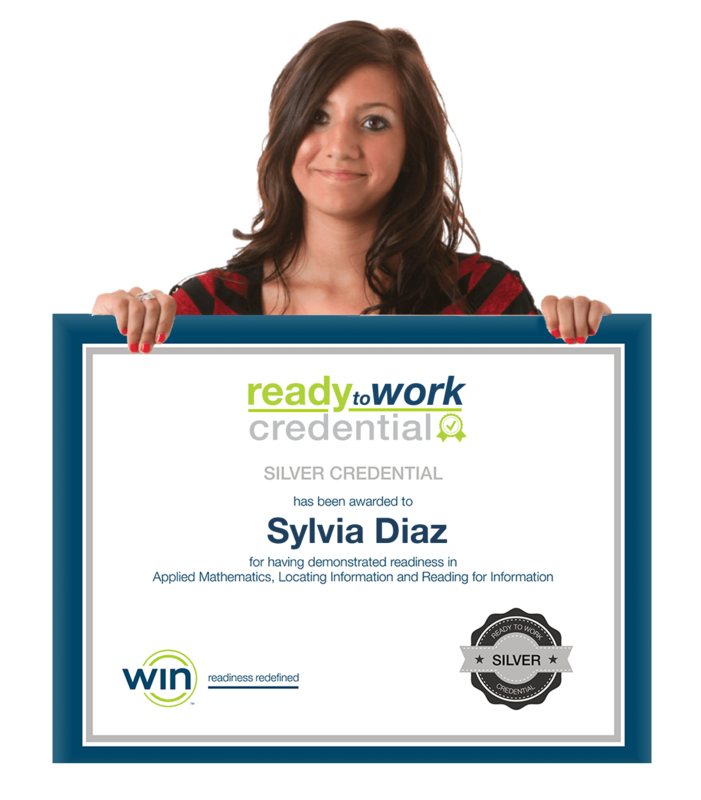 The Ready to Work Credential is a workforce education and development tool, comprised of three proctored assessments, Applied Mathematics, Reading for Information, and Locating Information, leading to a portable credential. It brings employers, learners and job seekers, and education / workforce partners together in building a skilled workforce, while keeping and attracting businesses with higher-wage jobs and economic growth. What skills do the assessments measure? Applied Mathematics measures workplace mathematical reasoning and problem-solving skills from basic addition, subtraction, multiplication, and division to multiple math functions like calculating percentage discounts and markups. Reading for Information measures reading comprehension and reasoning skills when using written text on the job including memos, letters, directions, signs, notices, bulletins, policies, and regulations. Locating Information measures comprehension and application of workplace graphics such as charts, graphs, tables, forms, flowcharts, diagrams, floor plans, maps, and instrument gauges. The WIN assessments are based on a compilation of prevailing employer-focused research including, but not limited to, the U.S. Department of Labor Survey of Necessary and Comprehensive Skills (SCANS); U.S. Department of Labor Building Blocks Competency Model (Tiers 1-3); U.S. Department of Education Employability Skills Framework; National Network of Business and Industry Associations Common Employability Skills; and Center for Literacy, Education & Employment, Equipped for the Future standards. The assessments are criterion-referenced against an absolute standard or “criterion” for performance. Thus, the assessments measure mastery of specific learning objectives rather than comparing an individual’s scores to the performance of other test takers. WIN Learning also provides online self-paced courseware to help learners and job seekers prepare for the Ready to Work Credential. The Ready to Work Courseware aligns to the Ready to Work assessments, making it a great resource for preparation or remediation. Contact WIN Learning today and ask about bundling the Ready to Work Courseware with the Ready to Work Credential to give your learners and job-seekers the right tools for the job.